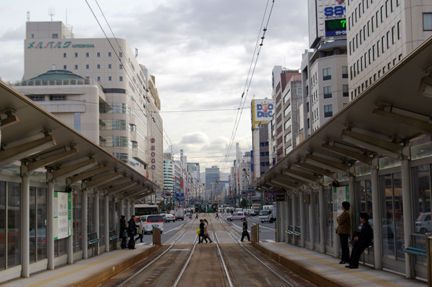 I realize that I never did finish my Japan travelogue. Amidst moving to another province and starting a new job, a few things got lost in the shuffle including my Led Zeppelin IV original LP, my beloved Mickey Mouse pajamas and my mind. And it's a damn shame because I really love 'Stairway to Heaven'. 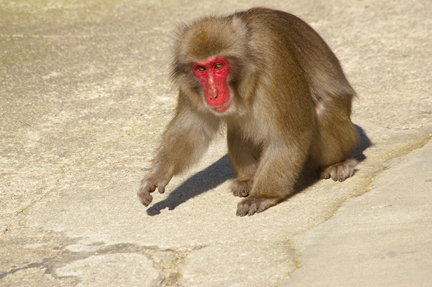 Anyway, I was just getting to the best part of my excursion to the land of the rising sun - Hiroshima and Miyajima Island, home to hundreds of feces-flinging wild monkeys. Duck!!! If I didn't realize it before, the train ride from Tokyo to Hiroshima definitely made me understand just how dense the population of Japan is; the entire island is just one MASSIVE megalopolis with Tokyo blending into Osaka, Osaka blending into Kobe...and everything meeting at land's end in Hiroshima. The contrast between it and Saskatchewan, the definition of wide open space, was like polar opposites. This is why Harajuku Girls exist...because it's easy to get lost in the sea of humanity. If I were to emulate their wicked style here in Saskatoon, I would be committed. Simply having all my teeth here is enough to stand out. I keed. I keed. 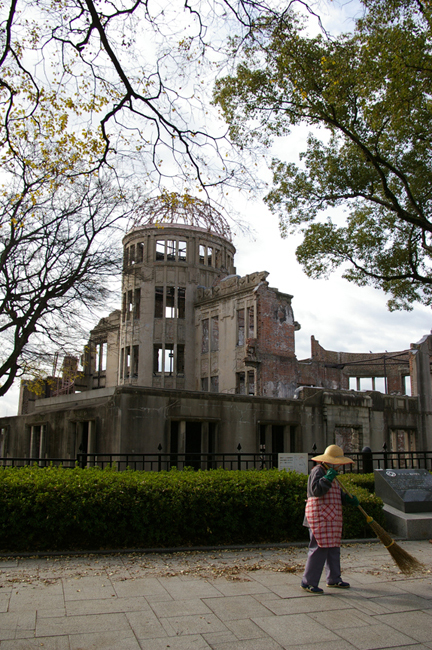 My first impression upon arriving at Hiroshima was that it was a working class, accessible alternative to the technological glitz and glamour that exists elsewhere in the country. More 20th century as opposed to the year 3000 ambitions of other Japanese locales. The city's tragic history could not be ignored though; a permanent calm hanging in the air was a blaring reminder of the horrific, world-altering events that transpired on August 6, 1945. Admittedly, Peace Park and the Peace Memorial Museum were the reasons for my visit. They are the main things that every tourist wants to see. It is twisted that a place with so much palpable sadness is a tourist destination, but I am only human and I want to see what humans are capable of. Wherever I travel, I like to observe the native wildlife. My opportunity in Japan was a trek to Miyajima Island, home of the aforementioned feces-flinging wild monkeys and a few docile deer. I tell ya...I have been around lions, tigers and bears but nothing has made me belatedly wish for a pair of liquid-absorbant underwear like these hairy beasts did. They were insane! Running about, pounding their chests and attacking anything that got in their way or smelled of cheese. I knew I didn't stand a chance. My cousin is the moon. Gathering my thoughts in the observation deck, I made a gameplan. I would leave my backpack behind and hike up Mount Misen (the highest peak on the island) as fast as my feet would take me. Awaiting at the top was a Buddhist shrine where I could ask forgiveness from the Heavens for violently murdering all those mosquitoes over the years, thus hopefully restoring good animal karma once again. After experiencing some of the most beautiful scenery my eyes have ever witnessed, we made our way from Hiroshima to Kyoto. Every - and I mean EVERY - travel book from Fodor's to Frommer's has written about how beautiful this former imperial capital is and touted it as THE must see spot in the country. It's supposed to represent "true" Japan, they wrote. It's supposed to be a delicate flower, the antithesis of Tokyo's brash weed. I just wasn't feeling it though and ended up leaving early. Sure, Kyoto is aesthetically and cosmetically different from the rest of Japan, with narrow streets evoking a bygone era when Honda and Nissan were just the names of oxen. However, I felt like I had seen it all before...it reminded me of numerous other Asian townships that I have visited. The one thing that I wished to capture through my camera lens in Kyoto proved elusive: the life of a Geisha is a dying art.